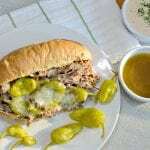 Slow Cooker Italian Beef Sandwich recipe with slow cooked, tender beef, delicious golden Mezzetta peperoncini, and soft bread. Add all of the ingredients (including the liquid from the peperoncini) to a slow cooker and cook on high for about 4 hours or until you can easily shred the beef. Shred the beef and return to the slow cooker with the cooking liquid. Let cook on low for another 15-20 minutes. Remove a serving size amount of the beef to a frying pan on medium low heat and top with mozzarella cheese. Cover and let cook until the cheese melts. Put the beef and the cheese on the roll and serve with some of the remaining "au jus" or other sauce. If you want the peperoncini to be crispier, wait to add them until the last 15-20 minutes after you have shredded the beef.